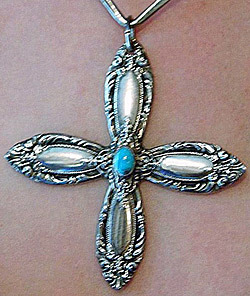 This vintage sterling silver cross is from the well known TOWLE sterling company and is offered now for your consideration. It is a substantial piece with a silver ring attached at the top, designed to be worn as a necklace. Fashioned with an intricate design on both the front and back, defining the four arms of the Cross, it is a treasure to be given as a gift on a very special occasion or perhaps for a very special person like you! It comes in its original box marked, TOWLE SILVERSMITHS, in perfect, never-worn condition. Layaway is always an option. Shipping is free within the USA.